After watching the first episode of The Great British Bake Off on demand at the weekend, I was (somewhat unsurprisingly) overcome with the urge to bake! So at 7 o clock in the evening I got my sous chef, a.k.a Jon my boyfriend, to join me in the kitchen to whip up a batch of Caramel Cupcakes! After a bit of rummaging in his mum’s cupboards (I’ll replace the ingredients Mrs Moore, I promise) I stumbled across some soft brown sugar. I decided that I would tweak my normal recipe and come up with something a little more sophisticated. Here’s how you make these delicious Caramel Cupcakes! Cream together the butter and the sugar for the cupcakes in a large bowl. When the mix is soft and creamy, slowly add the 2 eggs, beating with an electric whisk until fully combined. Next fold in the flour and salt creating a light, airy mixture. Place the mix into cupcake cakes no more than 2/3 full. Bake in the centre of the oven for 15 minutes or until golden brown and springy to the touch. Once baked, leave the cupcakes to cool on a wire rack before icing. For the icing, melt the sugar and butter in a pan. Add the evaporate milk and heat for at least half an hour or until the mix reaches softball stage on a sugar thermometer (don’t worry it’s worth it in the end). 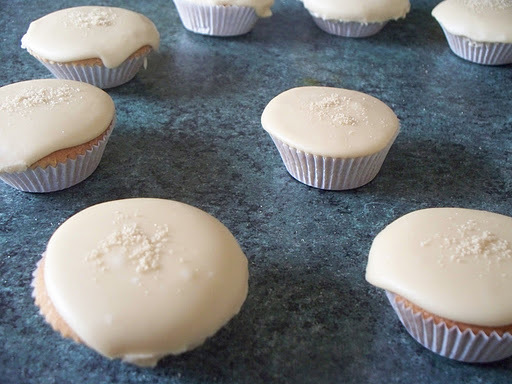 Gently pour the icing over the cupcakes and finish with an extra sprinkling of brown sugar before serving. Love the colour of these. Brown sugar is great for giving a fudgy texture or caramel flavour to things. Your cupcakes look delicious. Thanks choclette! I think the only way I can really describe the difference between cakes made with brown sugar as opposed to caster sugar is that its a more well rounded sweetness! Delicious! They are definitely going to be one of my go to cake recipes from now on!